There have been updates on the Finnish blog almost every month. 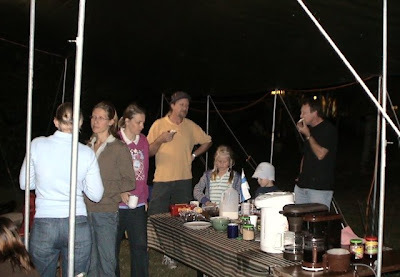 This blog and the old picture page have been neglected. Nothing really new and exciting has happened to us. 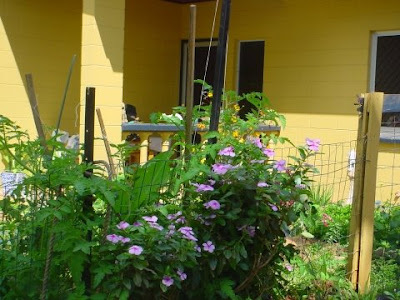 It has been just work work and work, work to get money and work in the garden. At home peaceful quiet living with the animals. Feeding them and bringing them to the vet ... and paying the vet bills that are typically not so small ... So, nothing else but some selected photos that were taken during the year. And one piece of video that you can see above. Just from the yard and garden. Spoken in Finnish for my Finnish blog. Let's start from the one that has caused the biggest vet bills this year, the cute little kitten from the Woodstock dump, an alpha male with the Finnish name Misu. He has been getting some hormone shots and sometimes even Clomicalm tablets to treat his aggression and nervousness. Didn't help much but he has to be kept locked in and away from other cats all the time. Recently he has got some problem with urine crystals and infections in urinary tract related to that. Now he is on special diet. No more dog food for him. So sad! He used to love it so much and he loves being with dogs. On the left sugarcane plus a nice flowering tree that I can't name. And then cordyline (fruticosa), a nice purple plant. And then on the right a stughorn that was mount on a piece of palm tree trunk. And the palm tree trunk was mounted on a stump of and umbrella tree. You can see the tree pushing new shoots above the piece of palm tree trunk. That trunk has already became hollow and will be broken in pieces soon so next year might need to mount the staghorn somewhere else. What might these nice purple flowers be called? Don't know but they are beautiful. Our house and garden from the street. 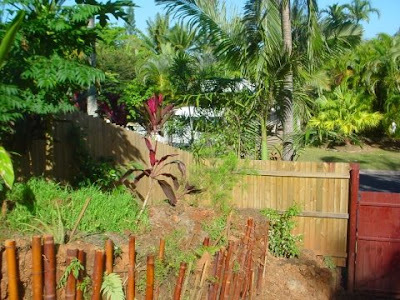 The hedge made of several types of bushes, included hibiscus, might need some trimming later on. But we'll let it grow to the fullest first. The one who comes to the house from the street sees the red gate with some chinese decoration and the yard through the little round hole. 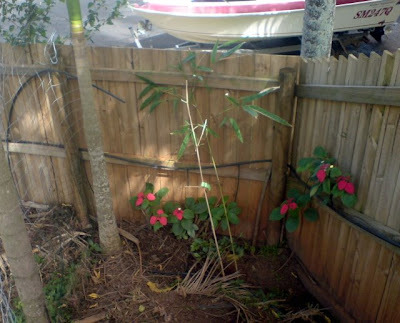 Hope near the fence these red Bangkok rose and bamboo will grow well and be part of the hedge that is growing mainly on the other side of the fence. 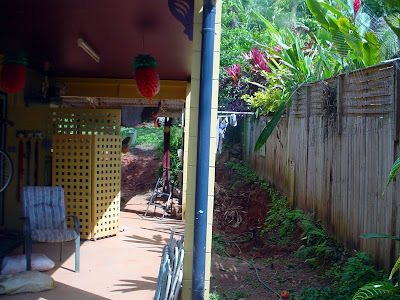 Next to the small garage area is the fence agains the right side neighbour's yard. 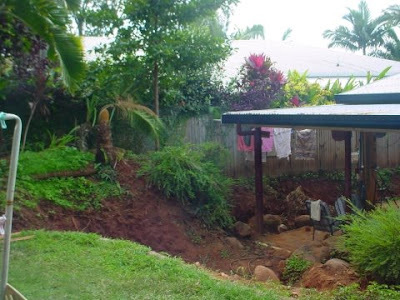 I have been digging there a lot to remove some tree stumps, roots and just earth in order to make it lower than the floor of the verandah. 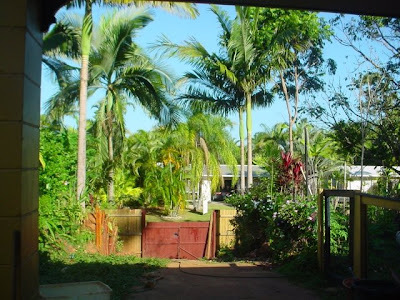 As a long-term plan, I want to build some drains there for the rainwaters, and a long and narrow rainwater tank right next to the timber fence. And then the biggest digging project. Right behind the pation there was a slope. A year ago I started removing it in order to make way to the wind to blow and prepare the area for swimming pool, spa and sauna. Again a long-term project. I have been manually digging there hundreds of wheelbarrow loads of soil, mostly just red clay mixed with some sand and broken using gypsum. No doubt that will be another life-time project for me. Another project going on has been a little mound in the front yard next to the driveway from the gate. Lots of trees have been removed from there. Then I made the driveway wider so that you can park a small car on the side. Then I mounted some posts in order to prevent the slope from collapsing. Before that I had tried to make it higher by piling up tree trunks, clay, mulch and good quality garden soil. In a few months these posts will be covered by flowers and other plants that will grow on that mound. 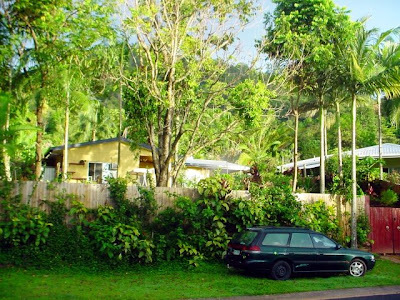 See the birght coloured cordylines on our and the neighbours side. I want to have more of them growing here. The same place from a bit further. 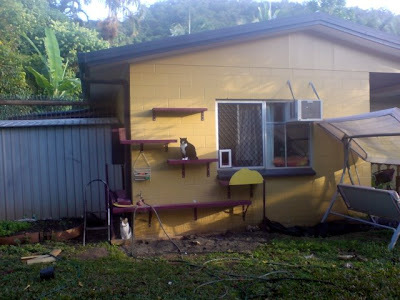 In the front yard I have built some shelves for the cats to climb on. On the ground Misu is captured in his cat run that is connected to his big cattery on the other side of the shed house. 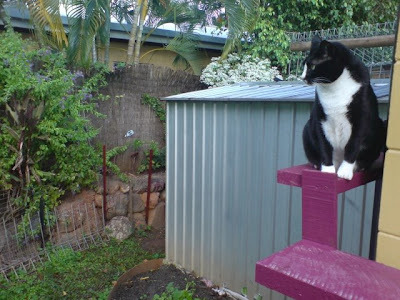 Also on the roof of the shed there is an area for Misu where he can sit and look at the world. Also Kitti enjoys sitting high up and looking around. She wants to take care that dogs in the front yard won't see her. And this is the same place from inside the house. 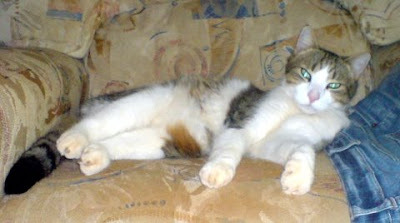 This big bedroom with air conditioning is mainly used by the cats Kitti and Spartacus. Misu is not allowed to go there and Lolitha visits only when it's raining or she is exceptionally hungry. 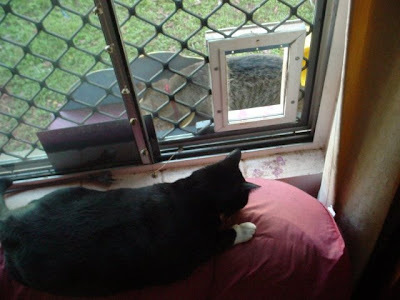 Here you can see her eating outside and Kitti watching the cat door. Shortly after I had painted the shelves I discovered some cute purple pawprints all over the place. 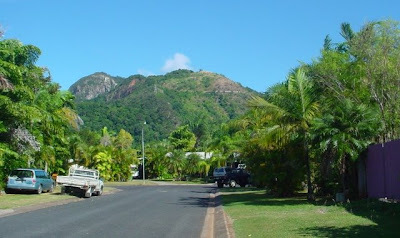 Above you can see a view from our street and the Kuranda train going up on the mountain. And the same mountains from further. Here we go for a walk with the dogs sometimes on sunday mornings. 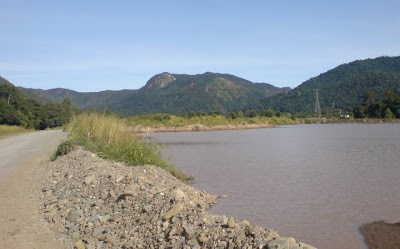 And there is the river nearby. 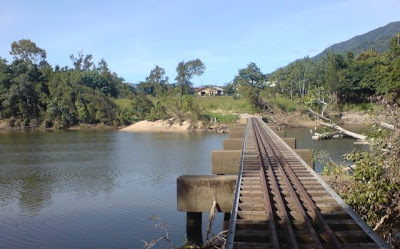 And there is a railway bridge over the river for sugaer cane trains. We both have visited Brisbane, the capital of our state Queensland, this year. Timo's favourite there so far has been the rail system. Not so advanced and nice than in Singapore or Finland but very advanced compared to public transportation in Cairns. 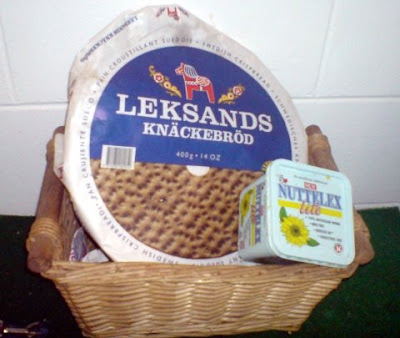 And another of my favourite things is Leksands Knäckebröd, hard swedish crispbread (with Nuttelex vegetable-oil spread that tastes like butter). Nancy brought it from Sydney where she has been a few times. 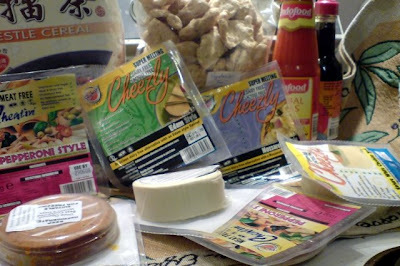 Once she brought me non-dairy cheese of the brand Cheezly and some veggie pepperoni. And then, Singapore, of course our mrs is going there every year, this year already 3 times. I haven't been there for 6 years soon but still have strong memories connected to places there. 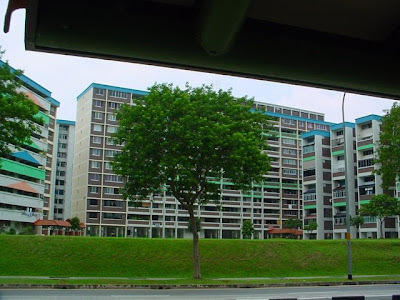 This is the house in Hougang avenue 7 where we were living about 2 months after getting married. 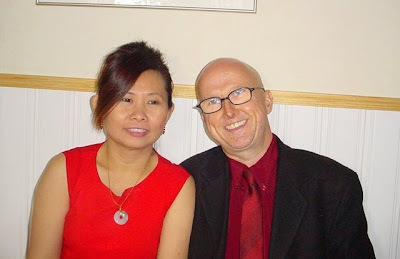 It really was 6 years ago when we went to Finland for our wedding. Haven't been there since. Haven't had a sauna since. I really miss sauna. Had a few in-real-life contacts with Finns. In the end of July when it's Midsummer in Finland, we were having a little celebration with some people of Finnish heritage in town. 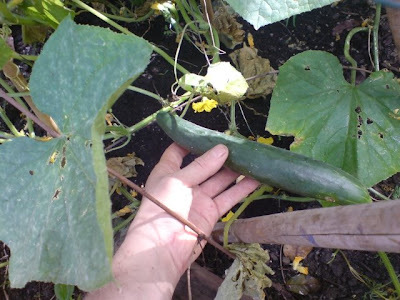 During the winter I grew lots of yummy cucumbers. They were not suitable for pickling so I had to buy proper gherkins for that puprpose. And they came out so yummy. 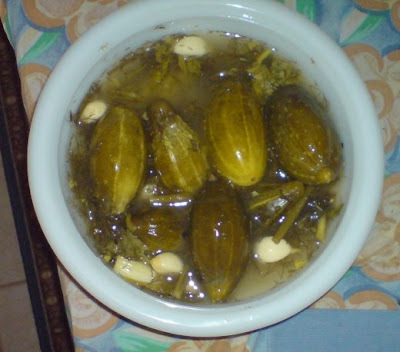 Real lacto-fermented gherkins spiced with black pepper, mustard, garlic, dill and salt.